Bar codes are used for a lot of purposes from product coding and inventory control to providing electronically-readable tags giving supplemental information such as web links related to a place or thing. The name tends to be used generically to cover all sorts of printed tags that can be read by machines, even if some don't actually have bars in them; they may have dots, squares, triangles, or other shapes instead. Some are "one-dimensional", read linearly; others are "two-dimensional" with a matrix of shapes. Some make use of color to distinguish elements, but most are monochrome and can be printed in any arbitrary color (usually black). 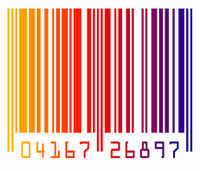 A bar code format is known as a "symbology". The 1979 comedy book The 80s: A Look Back, giving a fake "future history" of the 1980s, had fake bar codes (in a square format) on every page, parodying a belief that this sort of thing (proposed to be used in computer magazines to provide scannable program code) would go mainstream. The book also had an article "Adieu, Print" about the demise of print publishing, which was a few decades ahead of its time. This page was last modified on 7 January 2018, at 16:33.